This article is about the commando armor from Halo 3. Were you looking for the commando armor from Halo: Reach and Halo 4? The Commando harness is a harness worn by the Covenant's Commando Unit, a special operations formation of the Covenant military, subordinate to the Special Warfare Group. The Commando harness is a lighter and sturdier counterpart to the standard-issue combat harness. The helmet features hardened communication gear and up-link capabilities, and the thoracic cage is streamlined for greater maneuverability in close environments. Lightweight construction materials and advanced internal components increase overall performance making the wearer more deadly in combat. Unlock: Earn the Overkill achievement in any ranked free-for-all playlist. Description: "Standard issue helmet for newly formed Commando Unit based on pre-contact ground forces pattern; upgrades include hardened communications gear and uplink capabilities." It is similar to the Assault harness but is more smoothed and, unlike the Flight harness it is more rounded than angular. Unlike the Assault harness it features separate mandible guards. There is a small blue light on the forehead, one on the chin and one under each eye, which are also small blue lenses. The helmet also angles and slopes forward, giving the head a narrower appearance. The helmet also has a transparent neck guard with some aesthetic stripes down it's sides. This is the one of the rarest Sangheili helmets due to the high level of skill required to unlock it. Unlock: Originally unlocked by earning the Steppin' Razor/Halo 3 Auto-Updates. Description: "Distinctive deltoid protection calls to mind images of the heroes of the Second Illumination and their glorious successes throughout the Struggle for Ideological Purity." The shoulder pauldrons for this armor model appear to be similar to the Combat harness model, but more smooth and curved. Unlock: Earn the Triple Kill Achievement in any ranked free-for-all playlist. Description: "Streamlined thoracic cage allows for greater maneuverability in close environments; lightweight construction materials and advanced internal components overall performance." The thoracic cage has a line of separation in the center, with a small, silver, half oval-shaped block protruding in the center. A Sangheili with the Commando helmet. 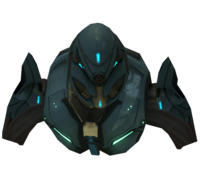 A Sangheili wearing the Commando harness on Epitaph. Concept art for Halo: Reach bearing resemblance to the Commando harness. ↑ Bungie.net: "The longstanding “Elite Commando Shoulders aren’t unlocking with the achievement” bug is being resolved in the auto update. The shoulders weren’t unlocking when the Steppin’ Razor achievement was acquired. In the post-auto update era, the Commando shoulders will be unlocked for everyone, regardless of the status of the corresponding achievement."